I’m not sure what those spots are but I think it’s due to all the rain. Is it called leaf spot? Do you know? I seem to get it to some degree every year. Seems early this year – I’m guessing it’s related to humidity (been raining forever here). Doesn’t seem to be affecting flowering and fruit set yet. Time to look up some new recipes. Ours are nearly ready, I’m a wee bit excited! Have not grown them for over a decade after my one and only attempt left me eating inedible beans due to not knowing how to prep them properly. Now having put in 100 odd plants that are fruiting nicely, I’m hopeful I can prepare them properly and eat some yummy dishes (and fill the freezer!). With 100 plants I’m fairly certain you will be able to fill the freezer! Have you got photos of your crop growing on your blog? I’ll come visit. What a great plan. I need to learn how to preserve more food, including in the freezer. Food goes into our freezer and remains there long after we’ve forgotten what it is. 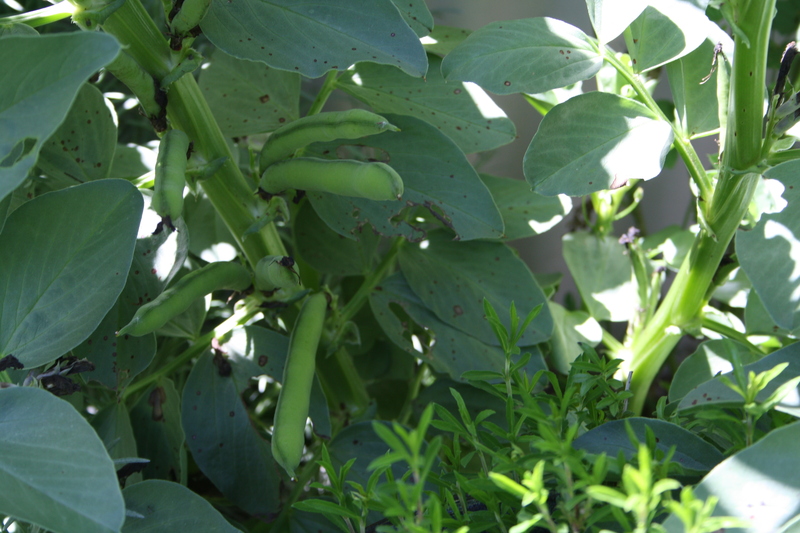 I have to say, I picked some really short pods the other day – about 10-15cm long, and I fried and ate those beans without doing anything else. But once they reach about thumbnail size or slightly bigger I find the outer shell inedible. Sorry to be late replying to your question about wood ash and broad beans. I went away for 10 days and came home to a jungle. Anyway I use wood ash on all my garden beds flowers and veggies and fruit trees. I think it helps produce more fruit, sweetens fruit, helps resistance to light frost and with the broad beans it’s supposed to help with rust problems. I have a wood heater so I have plenty of ashes. I alway ash the veggies beds after after they have finished one season and am getting them ready for the next planting. Fruit trees and flowers probably get done less often but that’s a time thing. We had frost into December last year and virtually no rain at all. This year has been wonderful! Plenty of rain. I live south of Bendigo and don’t really get their weather. I think maybe I am on a different planet!